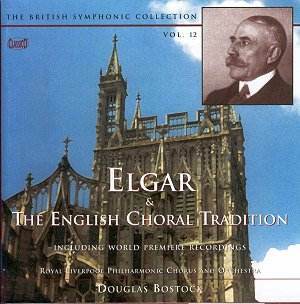 Not having any desire to distract you from the excellence of the orchestral playing the accomplishments and inspiration on display here represent English choral singing at its best. The smoothness, unanimity of enunciation, and ear-endearing luminosity of the singing resonates long after the disc is out of the CD player. The modestly radiant Bridge setting of Thomas à Kempis represents an ecstatic-contemplative path that the composer seems not to have taken again. The quality of the writing is predictive of Delius's Requiem and Song of the High Hills. This is not its first recording. The piece has been available on a Pearl LP (never reissued on CD?) although this is now long gone. There the conductor was Howard Williams. That was preceded by a BBC studio version with the baritone Michael George, the BBC Singers and the BBC Concert Orchestra conducted by the unjustly forgotten Ashley Lawrence - the hero of many a British music revival on radio. The BBC broadcast came and went on 7 September 1979. Neither that broadcast nor the Pearl come close to the honeyed introspection of this ClassicO version. Unlike Patrick Hadley (who deserves much better) Howells has been done reasonable justice on disc. Chandos and EMI are the principal champions. Even so, until now there has been no recording of his Sine Nomine. This work again lifts us to the lofty heights through the use of vocalisation by two soloists and choir. The vocalisation is on the �o� sound in the word 'dove'. This is a work of raptly angelic contemplation with the twists and turns of harmony and melody looking towards Vaughan Williams' Pastoral Symphony. The writing has one looking into the glorious light of the sun shining in benevolence. Full sung texts are reproduced in the sensibly presented booklet. The font size is practical and the writing courtesy of Lewis Foreman, ClassicO's guiding light for the British Symphonic Collection, is peerless. The Elgar, Howells and Purcell are world premiere recordings as is the wont of this ClassicO series. The orchestral version of the Dyson appears for the first time on disc. The piano version is on SOMM. Dyson served in France during the Great War. His little manual on grenade fighting became a vocational classic. The Blacksmiths is a unique piece which sets a Middle English poem of the 14th century. It is a work of grim little rhythmic cells, wails and grimaces, impacts and percussive shots. The writing reminds me a little of Walton's Belshazzar but also, and most vividly, of Bliss's The City Arming from Morning Heroes. Havergal Brian's Psalm is the earliest piece on the disc. Though praised by Elgar it made no headway at the time and the orchestral score was lost in 1920. The composer had to re-orchestrate the work all over again in 1945. It has been recorded before - though never on CD. The first commercial recording came out during the early 1970s on a CBS LP which also contained the English Suite No. 5 and the gloriously concentrated and grittily embittered Symphonia Brevis (No. 22). While there are Elgarian elements in this it reminds me of more of Kodály's Psalmus Hungaricus and the patriotic cantatas of Sibelius. The work includes some lovingly rounded quiet singing - full of the sort of gentle majesty you hear in Walton's much later Coronation Te Deum. Now to the two Elgar pieces. First the orchestration. Elgar was no stranger to arranging the works of other composers. Bach's organ music was one of his marques. The Purcell piece has its grandeur amplified and unsurprisingly is extremely effective in the massed choral passages. The rather glutinous baritone is admirably steady of tone production. With Proud Thanksgiving dates from 1920 and is an abridgement of the first part of The Spirit of England triptych. Essentially it is a grandiloquent cortège with the grimly funereal tread of the parts of Elgar�s Second Symphony. The choral singing touches on that of Brahms' German Requiem. It shows a surprising tenderness which I more naturally link with Vaughan Williams� Dona Nobis Pacem - not a connection I expected to make. Those who, like me, insist on looking a gift-horse in the mouth might wish for something other than the Purcell and Elgar. This disc would have been crystalline perfection if only it had included the Balfour Gardiner April and Philomela and Constant Lambert's poetic brevity Dirge from Cymbeline. As it is the disc will be guaranteed a much wider currency by the two Elgarian connections. This is not to be missed by fans of lyrical British choral music. Those who appreciate their Vaughan Williams and Delius will not be disappointed - richly rewarded in fact.